SAN JOSE, Calif., April 10, 2019 (GLOBE NEWSWIRE) -- NETGEAR®, Inc. (NASDAQ: NTGR) the leading provider of networking products that power today’s small to medium-sized businesses (SMBs), announced that leading independent testing firm, Miercom, after extensive testing commissioned by NETGEAR, has concluded that NETGEAR Insight Pro network management capabilities are representative of the expansive shift by the industry to cloud-based solutions, which reduces cost while providing more value, earning the Miercom Performance Verified certification of excellence. Miercom tested NETGEAR Insight Pro against Network as a Service (NaaS) industry offerings in the application’s capability to handle the specific needs of Managed Service Providers (MSPs) to maintain multiple client accounts. The Miercom analysis followed a list of questions that MSPs would have in evaluating a new service infrastructure and shared their resultant findings. The questions included categories such as management, deployment, reporting, support and the total cost of ownership, with NETGEAR Insight scoring an “excellent” rating on most accounts, in dramatic contrast to the other evaluated offerings. The questioning aligned around what is the perceived need for MSPs and their small business clients to manage their networks adequately and securely from a remote location. A small sample of what you can learn from the report has been provided below for reference. In the evaluation of the amount of time it takes to deploy, Miercom determined that Insight Pro excelled in this area where it took only 10-15 minutes to get the management service running for a given network on first deployment. With an intuitive set up wizard and organizaion can be up in 10 minutes with the addition of new locations taking only five additional minutes. Insight Pro also excels in its manner of reporting and monitoring via activity logs and across the network for all devices, users and applications. NETGEAR offers the most straightforward and feature-rich view of information on a client’s network that is unmatched by competitors. An Insight Pro administrator has visibility into organizations, locations, device status, wireless settings including SSID, bandwidth, client connection to access points and configurations as well as the wired VLAN, PoE scheduling, networked storage status and firewall updates for any location. As for security, Insight does not necessitate the need for open ports to enable remote access. Additionally, two-factor authentication is implemented for both the cloud portal and the mobile app for Insight Pro, ensuring that an administrator can manage the network securely from a single pane of glass regardless of location. And, in summary, Miercom also determined that NETGEAR Insight total cost of ownership was the lowest when compared across this competitive analysis. Read the full report to learn more at Miercom.com, NETGEAR Insight Pro competitive assessment of Network as a Service (NaaS). Insight Device Portfolio Expansion: Continued addition of new device-support by Insight to include WAC540 access point and the new GS switches. Custom Reports: Enhanced reporting functions, with numerous new reports, customizable parameters, and adjustable branding. Network-Level Config Copy and Clone: Insight Pro now allows Admins to create and save device configurations and network settings which are ready to be applied for other networks. Device Backup and Restore: MSPs can now save time when setting up multiple devices by applying the same configurations of one device to another, or quickly restoring lost settings directly on the web, Cloud Portal. 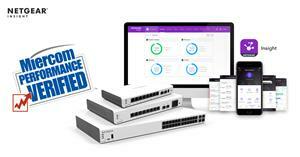 Insight Pro is available globally through the established NETGEAR Distributor network. It is available in various subscription packs based on the number of device credits and the length of subscription terms. Pricing will be provided by your Distributor. Discounts based on volume and term length apply. For more details on Insight Pro, please visit the Insight Reseller page on NETGEAR.com. NETGEAR (NASDAQ: NTGR) is a global networking company that delivers innovative products to consumers, businesses and service providers. The Company's products are built on a variety of proven technologies such as wireless (WiFi and LTE), Ethernet and powerline, with a focus on reliability and ease-of-use. The product line consists of wired and wireless devices that enable networking, broadband access and network connectivity. These products are available in multiple configurations to address the needs of the end-users in each geographic region in which the Company's products are sold. NETGEAR products are sold in approximately 23,000 retail locations around the globe, and through approximately 22,000 value-added resellers, as well as multiple major cable, mobile and wireline service providers around the world. The company's headquarters are in San Jose, Calif., with additional offices in approximately 25 countries. More information is available from the NETGEAR investor page or by calling (408) 907-8000. Connect with NETGEAR on Twitter, Facebook and our blog. ©2018 NETGEAR, Inc. NETGEAR, the NETGEAR logo, and ProSAFE are trademarks and/or registered trademarks of NETGEAR, Inc. and/or its affiliates in the United States and/or other countries. Other brand and product names are for identification purposes only and may be trademarks or registered trademarks of their respective holder(s). The information contained herein is subject to change without notice. NETGEAR shall not be liable for technical or editorial errors or omissions contained herein. All rights reserved.